I measured the XFree Tunes using a G.R.A.S. Model 43AG ear/cheek simulator/RA0402 ear simulator, a Clio 10 FW audio analyzer, a laptop computer running TrueRTA software with an M-Audio MobilePre USB audio interface, and a Musical Fidelity V-CAN amp. On the Model 43AG, I used the new KB5000 and KB5001 anthropomorphic simulated pinnae for most measurements, and the older KB0065 right pinna for certain other measurements as noted. For measurements in Bluetooth mode, I used a Sony HWS-BTA2W Bluetooth transmitter to get the signal to the earphones. These are “flat” measurements; no diffuse-field or free-field compensation curve was employed. 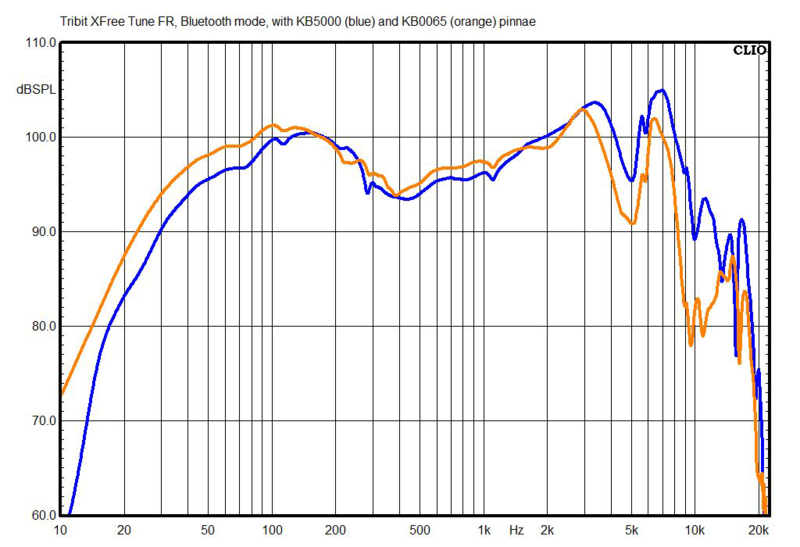 The above chart shows the XFree Tunes’ frequency response measured in Bluetooth mode with the new KB5000 and KB5001 anthropomorphic simulated pinnae. 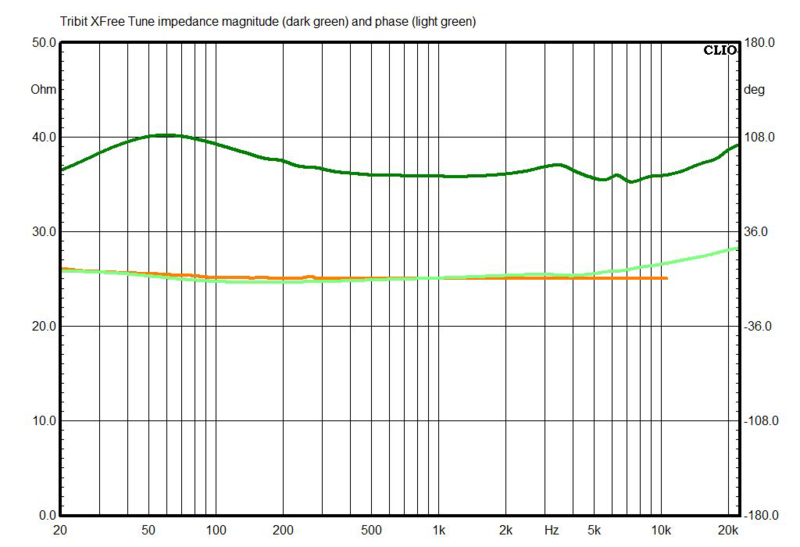 If that upper bass hump centered at about 150Hz were instead centered at about 70Hz, this would be pretty close to a “textbook” frequency response for over-ear headphones. This chart compared the response of the XFree Tunes using Bluetooth versus using a wired connection. 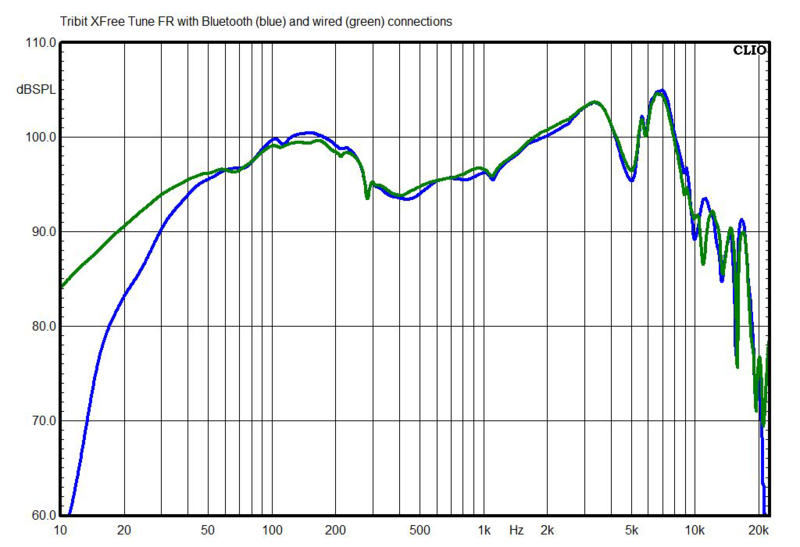 There is bass roll-off below 50Hz with the Bluetooth connection, but otherwise the plots are effectively identical. It’s possible that the roll-off could be due to the signal gating I had to use to counteract Bluetooth’s latency, but I got the same result no matter how I set the gate, so I suspect the bass roll-off is inherent to the sound of the XFree Tunes in active (i.e., Bluetooth) mode. 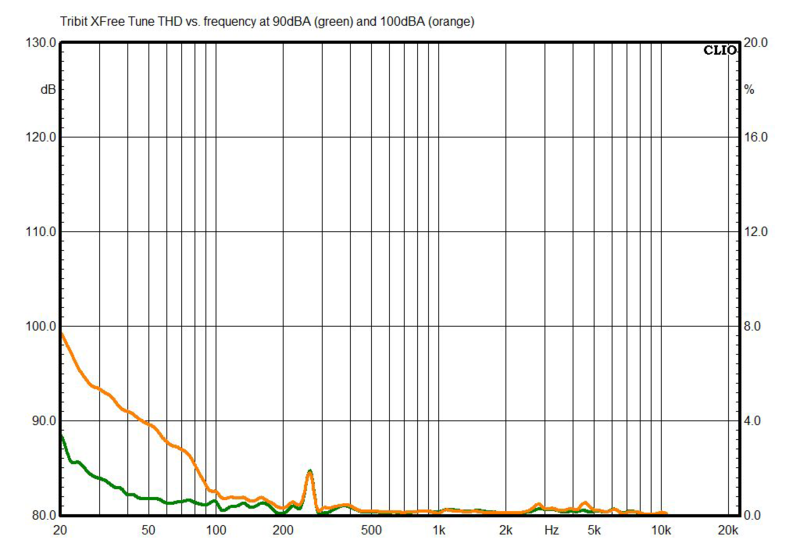 This chart shows the XFree Tunes’ right-channel frequency response measured with the KB0065 simulated pinna (which I’ve used for years) and the new KB5000 simulated pinna, which I recently switched to because it more accurately reflects the structure and pliability of the human ear. This is just for sake of comparison with older measurements of mine. Here you can see how the XFree Tunes’ tonal balance changes when they’re used with a wired connection into a high-impedance source, such as a cheap laptop or some cheap professional headphone amps. 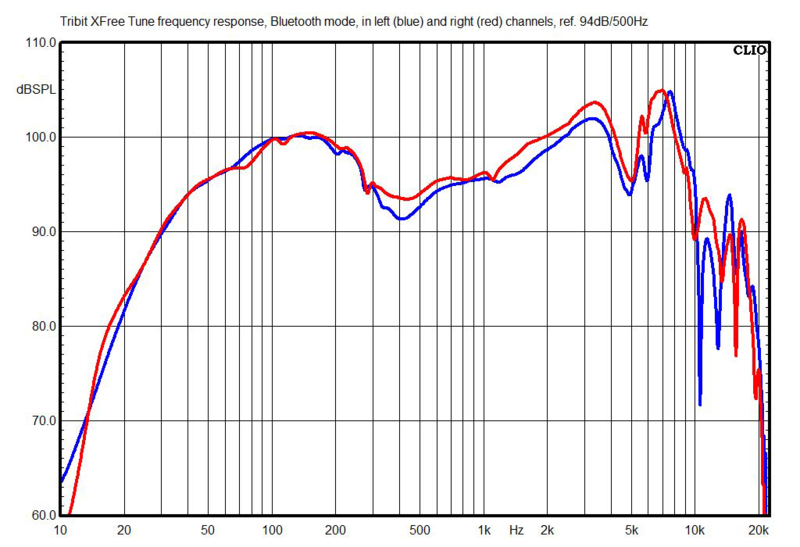 There’s barely any change at all, just a roughly 1dB drop in bass response centered at about 55Hz. 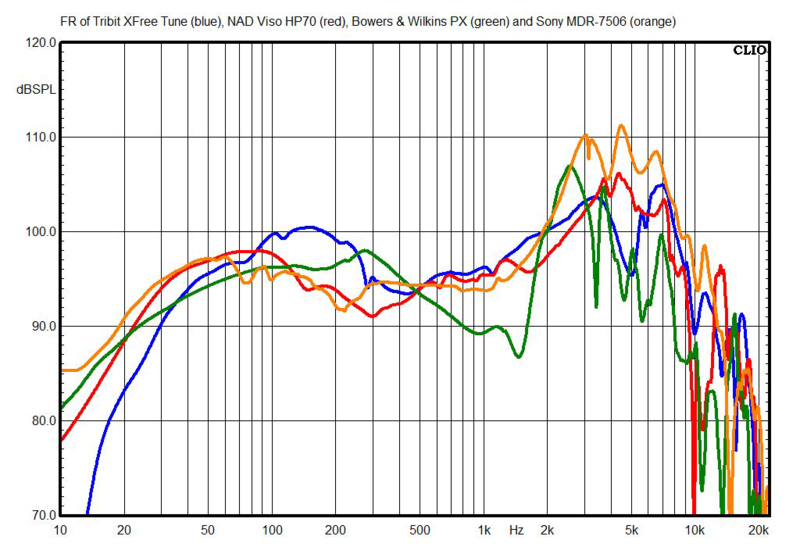 This chart shows the XFree Tunes’ right-channel response compared with two other over-ear headphones in Bluetooth mode with noise canceling off: the NAD Viso HP70s and the Bowers & Wilkins PXes. I also included Sony MDR-7506es, the over-ear model that currently best conforms to the “Harman curve,” shown in research by Harman International to be the preferred over-ear headphone response for most listeners. While it’s difficult to determine exactly what headphones sound like based on comparison charts like this, it’s pretty clear that the XFree Tunes have some excess upper bass energy, perhaps to offset their relatively modest bass response. 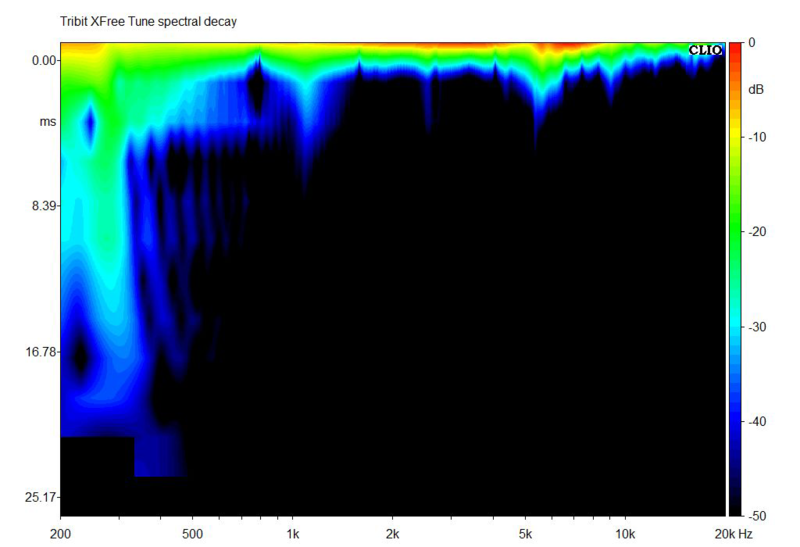 The XFree Tunes’ spectral decay (waterfall) chart looks clean except for some resonance around 300Hz, but it’s down to -30dB within 12ms, which is equivalent to four cycles at 300Hz. 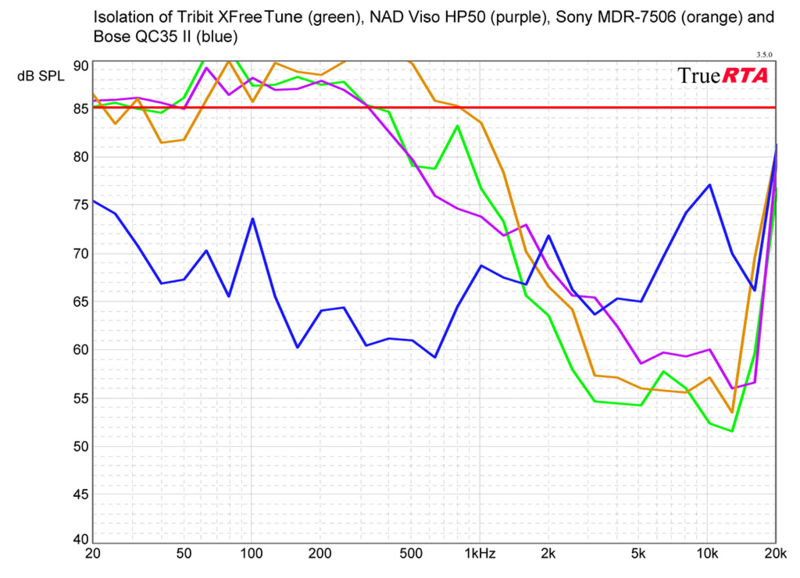 The XFree Tunes show significant distortion only at the extremely loud listening level of 100dBA, and only below 100Hz. At the still-very-loud level of 90dBA, the distortion measurement is about average for a dynamic-driver over-ear model, and there’s not enough distortion that you'd be likely to notice it. This was measured with a wired connection; the internal amps of the XFree Tunes may add some distortion, but my analyzer can’t compensate for Bluetooth’s latency when doing distortion measurements. In this chart, the external noise level is 85dB SPL, and numbers below that indicate the degree of attenuation of outside sounds. The XFree Tunes’ isolation is about average for over-ear headphones without active noise canceling. 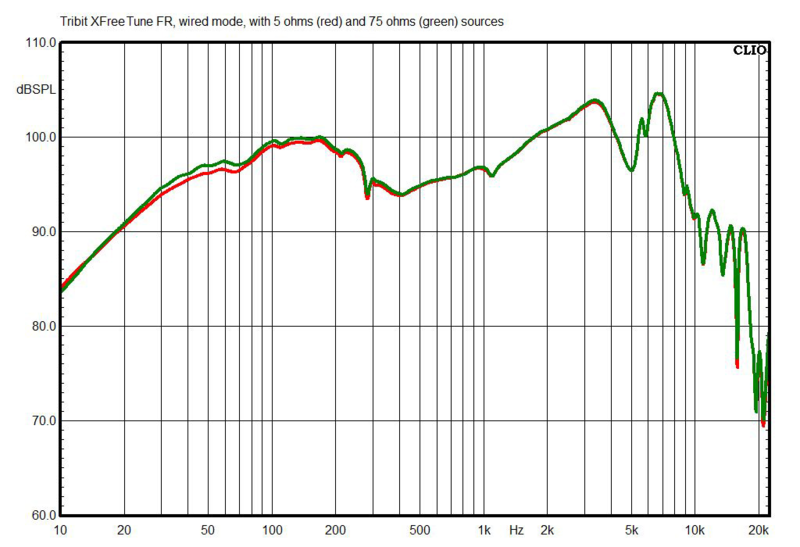 The XFree Tunes’ impedance response is very close to flat, averaging about 37 ohms and staying within a tolerance of ±2dB. Sensitivity of the XFree Tunes with a wired connection, measured between 300Hz and 3kHz using a 1mW signal calculated for the rated 32 ohms impedance, is 106.7dB, so you don’t have to worry about getting adequate volume when you plug into an airliner’s inflight entertainment system.